Panstage might be just about the best thing to happen to budding musicians on iOS since GarageBand finally saw a release. 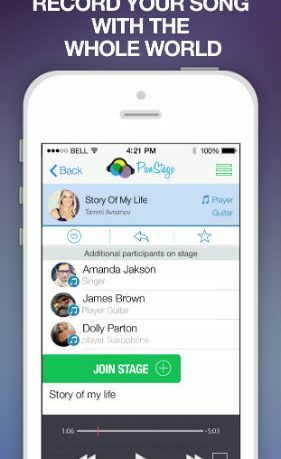 While Panstage is a completely different kind of app, I am sure it will soon be inspiring millions of songwriters, singers and musicians to create demo tapes and music with other, like-minded people. The app literally creates an open stage for anyone to perform on, and for anyone to join others on. You simply create a ‘stage’, give it a name and other people can instantly join in, if they so choose or simply enjoy listening to the collaborative results. Once you have made a stage, you can record a track, be that singing or via an instrument, to get the ball rolling. Collaborators can then add to that track, so you could start things off by creating a simple singing track, and another person could add a bass track and yet another could add a guitar, or drums. It is certainly a fabulous idea, but what is even more impressive is that the developer has somehow managed to pull it off, creating a unique and inherently creative social tool that could be an absolute joy for musicians. 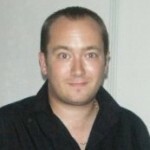 – Mix your playing and singing in multiple channels. – Record your song with musicians worldwide. – Harmonize your song with multiple instruments added by musicians. – Sing or play along in songs you like in an easy to use studio features design. – Store and share your recording. I have spent quite some time perusing and listening to some of the tracks on the app, and I have been very impressed, not just by the talent that is out there, but how some of the songs have evolved as more people get involved. It does feel like you are watching a real creative process unfold. It is fascinating to watch, and I am sure it must be doubly amazing to take part in. Some of the audio quality can have a bit of an echo, but I guess that is the nature of both the medium and the differing environments the music is being recorded in. However, the more I listen, the more I actually like the slightly sketchy quality, as I makes it feel like you are listening to a real demo tape, or to someone perform live in a garage. GarageBand, indeed. One thing I would like added is a proper chat option, so you could bounce ideas off other musicians before recording. It would also be nice if this was linked to a proper publishing platform, but I guess that will happen if the app really takes off. You can still save or share the tracks you make, however, so they are not trapped within the app, by any means. The app is well designed, and although there is a lot here, is never gets confusing or too intimidating. One thing that does need adding is proper support for the bigger screened iPhone 6 and 6 Plus. Overall, this is a truly superb app that makes collaborating with you own band as easy as pie, while also opening up your music for others to enhance and enjoy. 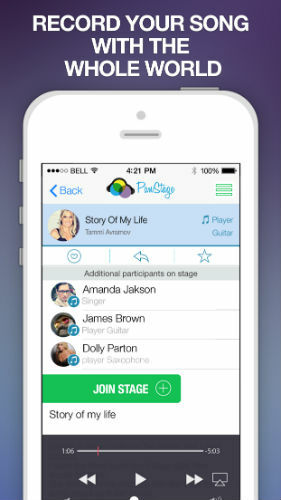 A real social take on music creation, Panstage is thrilling stuff.